Fifteen minutes before we need to leave for the Halloween parade is always a hectic time at our house and this year was no different. June’s costume had been pretty much finished for a week, but the paint was still damp on Noah’s. This is how it usually goes. 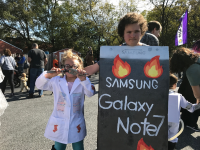 So at 12:30 on Saturday afternoon, Beth was spraying hairspray on June’s hair and teasing it into a mad scientist style, while I was cutting painted emojis out of poster board for Noah’s costume, carefully because the paint was still tacky. Meanwhile, Noah was using the paper cutter to cut up the business cards June was going to pass out along the route. Noah was a Samsung Galaxy 7 Note phone on fire. The flames are my favorite part of this costume and they were a group effort. Noah printed a model for tracing onto the poster board and he and June traced the shapes with pencil. Then he painted them with three layers of paint—yellow, then orange, then red. Then he and I cut them out and he and Beth glued them to the front of his costume with spray glue. Halloween inspires us to teamwork. 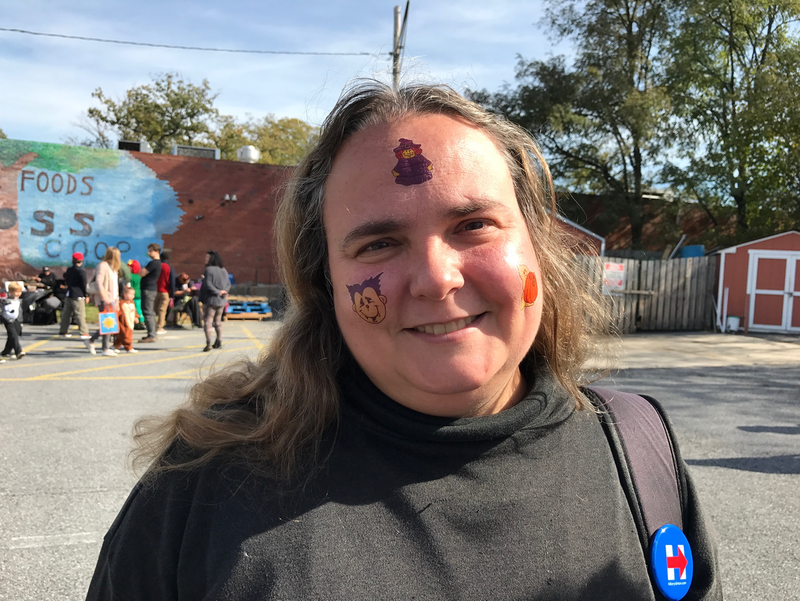 We had some Halloween-themed temporary tattoos, so though I wasn’t in costume, I got into the spirit by decorating my face with a witch, a vampire, and a ghost and the backs on my hands with a black cat and a mummy. Beth wore a necklace of plastic skulls that light up red, but it was too sunny for the lights to show. It was an unseasonably warm day. I was in a black turtleneck and a denim skirt with no tights or leggings and I was a little warm. I was glad June had opted for a camisole under her lab coat instead of a warmer shirt. We got to the Co-op parking lot around 1:15, fifteen minutes after the festivities started. There’s usually a lot of milling around before the contestants divide into groups for the judges. June guessed how many plastic spiders were in a jar and played some games. Beth, Noah, and I people watched and waited for the contest to begin. There were the usual adorable babies and toddlers in bee, lion, and bunny costumes. A boy who used to be in Kindermusic with June was either the Grim Reaper or a Dementor on a skateboard. A girl from her drama camp was the Phantom of the Opera and a girl from drama class was a Minecraft dragon. I think that’s what she was—neither of my kids has been much into Minecraft. I saw an unusual number of zombies this year—including zombie cheerleaders, a zombie prom queen, and some standard zombies. There were also several individuals and groups, male and female, going as Ghostbusters. My favorite version of this had a baby in a white snow suit with a sailor hat and collar as The Stay-Puft Marshmallow Man, though I was a little afraid he or she was going to overheat in that get-up. Noah thought his most serious competition for Most Original in the teen and adult category was the house from Up. The house wasn’t that detailed, though. Just cardboard rectangle and roof painted yellow. It’s an election year so I expected some political costumes and there was both a Hillary Clinton (accompanied with Secret Service agents) and a Donald Trump in June’s age group. The girl dressed as Clinton had a photo of Clinton’s face blown up and held in front of her own face and she wore a pantsuit. The boy dressed as Trump had a “Make America Great” hat and a blazer on, and there was money sticking out of his blazer pocket. There was an adult Nasty Woman and a Basket Full of Deplorables, which I never saw but I heard about later from Beth and Noah. I’d predicted someone would do that, but Beth and Noah said it wasn’t done the way I would have guessed. It was a man with a basket attached to his rear. I would have preferred it as a group costume with multiple people in a big basket. Speaking of group costumes there was a group of adults I think was going as decades. There was a flapper, Elvis, a hippie, etc. I liked that idea. People were walking around taking pictures of each other and both kids had their pictures taken by a representative from the Recreation Department and by strangers. Around two it was time to divide by age. I went to march with June and the nine to twelve year olds and Beth went with Noah in the teen and adult area. Usually the judges circulating through the crowd only ask a few people’s names and if they ask yours there’s a good chance, but not a guarantee, that you’re going to win. It at least means you’re under consideration. But this year the nine-to-twelve judge was asking every kid’s name and it took a while for her to get them all down. Then later, once we were marching, she came back and asked June for her name again. June thought that was a good sign. While we were waiting for the contest results to be announced, I commented to Beth, “It’s not too cold for gelato,” because we were standing right in front of Dolce Gelati. She didn’t care for any, but I bought some for myself and the kids. As we were eating the gelato, June realized she didn’t have her tongue. I went back into the Dolce Gelati and downstairs to the bathroom in the basement where we’d just been but I couldn’t find it. Shortly afterward, a friend of hers (the one dressed as the Phantom of the Opera) came up to us and said, “I found your tongue” and handed it to her. It was black from being on the ground, but she was glad to have it. “That’s why it’s handy June knows everyone,” I said to Beth. The Grandsons, a local band that always plays at this event, was up on stage playing. There’s usually a pretty long wait for the results, but sooner than I thought, they were announcing results for the four and unders, and then the five to eights, and then the nine to twelves, without pausing for music between results, as they often do. In June’s age group, Most Original went to Hillary Clinton, which was a bit of a surprise as Presidential candidates in Presidential election years are not really unexpected. Consider this—in the Family Circus in the Sunday comics, Dolly was Clinton and Billy was Trump. I think we can all agree that it’s in the Family Circus, original is probably not the right characterization. Scariest went to Donald Trump, another surprise because I didn’t think a contest run by a municipal government would go there. We waited for Funniest, because June had strategically tried to design a costume she thought could win any of those three categories. And they never announced it. They just took a break for a musical interlude before the teen and adult results. Well, we were all sad for June because it was a good costume and she really wanted to win, as did Noah. For whatever reason, both kids have latched onto this contest and it means a lot to them. Nonetheless, she took it pretty well, even if she was surprised. I think after her name was taken a second time, she thought she had it in the bag. I’ll admit, I kind of thought she did, too. After another song or two, they announced Most Original for teens and adults and it was one of the Ghostbusters. Scariest went to one of the zombies, a good one with a lot of elaborate makeup and Funniest was…the Samsung phone. The M.C. made a joke about asking him to stay away from the stage, but Noah went up and collected his prize, a $25 gift certificate for Busboys and Poets. He was happy to win, though I think he would have preferred Most Original. Unlike June, he has a clear preference for that category. While we waited for Beth to fetch the car, Noah kept telling June the judging was really bad this year. I was touched by that because I didn’t feel that as her parents Beth and I could say too much about it or we’d be modeling poor sportsmanship. However, he was better positioned to comment on it, both as her brother and someone who had just won. We headed home, made popcorn and watched It’s the Great Pumpkin, Charlie Brown, because June had been wanting to do that. Then I read Serafina and the Twisted Staff to her, while Noah did some homework. Around six, we dropped June off at her friend Claire’s house for their annual Halloween party where she met friends dressed as an archer, a fallen angel, a vending machine. Once we’d dropped her off, Beth, Noah, and I went out to dinner at Noah’s favorite Italian restaurant. Getting the kids out the door for trick-or-treating was nearly as rushed as getting to the parade. Right before it was time to leave, I realized I needed to do June’s hair because Beth wasn’t home yet, and the kids remembered I hadn’t gotten the Frankenstein’s Monster head candy bowl from the basement and we hadn’t set up either the little coffin with a skeleton and colored mist coming from it, or the bigger fog machine. I got the candy bowl and filled it and set Noah to work on the fog machines. 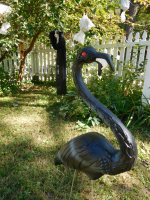 Plus, there were some Halloween decoration we never got around to putting the batteries in—despite June’s frequent reminders. And I never made a replacement Halloween playlist to play while waiting for trick-or-treaters. Over the years I’ve made two of these, both of which got accidentally deleted for some reason. The kids left around 6:40 with Noah was protesting it was too early and no one would be home and Beth and me telling them to go already because June was slow with her boot and he was slow in his costume and I wanted them home by eight because June would need to wash the hairspray out of her hair and he had undone homework. I did the dinner dishes and waited by the door for trick-or-treaters. I heard one group making their way through the fog on the way to the door saying, “I forgot about this house,” so I guess we were decorated enough, even without all the batteries. The kids came home a little after eight, and Megan came to the door around 8:20 while June was about to get in the bath, so she came to the door in a bath robe, with her crazy hair. Megan had called that afternoon to invite June to trick or treat with her, but between their more ambitious route and June’s ankle and Noah not having plans to go with anyone else, it seemed best not to change plans at the last minute. We promised June they could go together next year, maybe without adults, if it was okay with Megan’s folks. June and Noah tried to hit Megan’s house while they were out but no one was home, so I’m glad they at least got to see each other, however briefly. Megan had on a Mexican dress and a Day of the Dead mask and skeleton tights. This is Halloween for us. We decorate the porch and the yard and carve pumpkins, the kids make costumes and march in the parade. Sometimes they win the contest and sometimes they don’t. They come home on Halloween night with bags full of sweets and plans for next year. This entry was posted in Elections, Holidays by Steph. Bookmark the permalink.